Some Americans are coming around to the idea of sharing the road with autonomous cars, but many are wary of their safety and of letting vehicles have full control. Twenty-three percent of U.S. adults say they would ride in an autonomous vehicle now, and 42 percent say they might in the future, according to a recent Morning Consult poll. People also like the features driverless cars may have – 57 percent say they’re comfortable with autonomous vehicles braking to avoid collisions or accidents, as well as making steering adjustments to stay in the correct lane. Autonomous cars stole the spotlight at the North American International Auto Show in Detroit this month, with Nissan, General Motors and Google all promoting their driverless technology. Forty percent of people have a favorable view of driverless cars, compared to 47 percent who have an unfavorable view. Seven percent of respondents said autonomous cars and vehicles driven by humans are equally safe, while 41 percent say autonomous cars are less safe. Thirty-three percent say driverless cars are more safe than those operated by humans. Views about safety haven’t changed much in the past year. A year ago, 31 percent of adults said autonomous cars are safe, while 43 percent said they aren’t. Six months later, the same percentage said they are unsafe, compared with 29 percent who said they are safe. Trust in autonomous cars starts to drop when people are asked about changing speeds, automatically changing lanes and making turns. Forty-nine percent of people polled this month said they are comfortable with speed changes, with 32 percent saying the same about changing lanes and 37 percent saying they’re comfortable with the cars making turns. Respondents were also unsure about autonomous vehicles in cities – 53 percent said they are comfortable with the vehicles on open roads, while 32 percent feel the same way about autonomous cars on roads in large cities. In general, people don’t think that riding in an autonomous vehicle means passengers can simply kick back and not pay attention to the road. 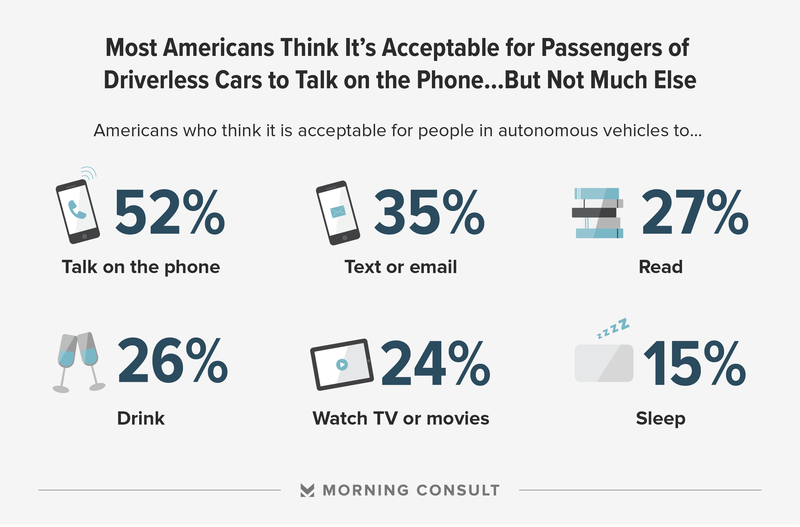 Fifty-five percent of respondents say it’s unacceptable to text or email in an autonomous car. Sixty-one percent say it’s unacceptable to read in an autonomous vehicle, and 64 percent said the same about drinking or watching videos. Seventy-five percent say passengers should not sleep in a driverless car. 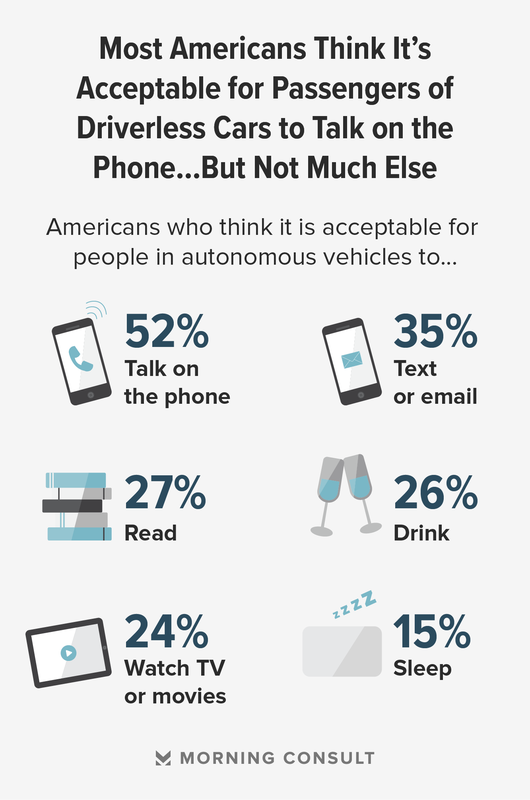 In contrast, 52 percent of adults are fine passengers talking on the phone in an autonomous vehicle. Respondents were conflicted when it came to choosing between the safety of pedestrians and of passengers in autonomous vehicles. When asked to choose between protecting passengers at pedestrians’ risk or prioritizing the safety of pedestrians over passengers, 48 percent of respondents — a plurality — picked the “don’t know/no opinion” option. This poll was conducted Jan. 12 through Jan. 13 among 2,200 adults nationwide, with a margin of error of plus or minus 2 percentage points. Crosstabs are here and toplines are here.